Bellafill is a special cosmetic injectable collagen facial filler that contains microspheres. It has the remarkable ability to instantly rejuvenate tired facial lines and wrinkles for a more natural-looking, beautiful appearance that lasts. A skin test in required (it is collagen) a small amount in the forearm 2 weeks prior to your appointment. 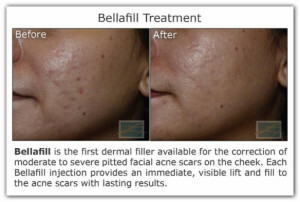 Bellafill is truly unique in the world of cosmetic injectables. Along with instantly volumizing the skin in order to erase wrinkles and smile lines, this innovative beauty treatment can literally recreate the structure of younger looking skin by encouraging the body’s own production of collagen. It’s a commonly used and approved dermal facial filler worldwide. At Laser Creations, we can help restore a more youthful appearance to your face using Bellafill. Formerly known as Artefill, Bellafill treatments can help you look younger and more refreshed without having to undergo surgery. Our staff can help determine the right treatment plan for you based on your skin and the results you’re trying to achieve. If you have a good amount of facial wrinkles, you’ll want to eliminate those key signs of inevitable aging – that’s where Bellafill comes in. It can effectively help the skin repair itself. When fat cells shrink and the skin begins thinning out, wrinkles start to develop. Use Bellafill facial filler to successfully eliminate premature aging, crow’s feet, and frown lines. Bellafill works to erase fine lines and wrinkles and has the ability to improve the texture of the skin with the very first injection. The secret behind Bellafill lies in the PMMA (polymethyl methacrylate) microspheres that exist in the bovine-based collagen gel. The special gel is typically injected in the fine lines that exist near the corners of your mouth, otherwise called nasolabial folds. The injections themselves trigger the body to make its own natural collagen. It’s been proven that PMMA is safe to use and is considered the main catalyst behind an immediate facelift. For optimal effectiveness, Bellafill treatments should ideally be scheduled a minimum of six months apart. For best results, small dosages administered at specified intervals work best. If you’re receiving Bellafill treatments, usually one or two sessions is all it takes for this noninvasive, safe procedure to work and typically takes less than an hour. The Bellafill grade will primarily depend on the severity of the patient’s wrinkles. For instance, grade five will need two syringes for injection into the folds. Once the Bellafill solution in injected, the effects are instantly noticeable due to the obvious disappearance of fine lines and wrinkles. However, expect a bit of mild redness and swelling at the injection site following treatment along with mild bruising in some cases as well. The majority of side effects typically subside in about 3-7 days. For best results and to maximize safety, have an allergy test performed prior to getting a Bellafill treatment in order to avoid any unforeseen complications or problems. How long do the effects of Bellafill last? The long-term results of Bellafill will generally last anywhere from 5-10 years for most people. Bellafill primarily consists of bovine collagen, which works to keep skin full, taut, and youthful looking. The unique bio-compatible microspheres provide the skin with a smooth, long-lasting effect since they’re not absorbed by the body. The Bellafill procedure usually takes anywhere from 15-45 minutes from start to finish. When properly done, the results are nothing short of amazing and should be expected to last for many years.